Nothing is more aggravating than trying to sharpen a turning tool on a wheel with a lot of vibration. 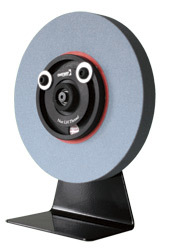 Now you can balance any wheel with a 1" diameter center hole to achieve smooth vibration-free grinding. This translates into a sharper tool and longer life for your grinder! The special hub is fitted into the center of the wheel. Then it is placed on the Oneway balancing fixture. The heavy side naturally falls to the bottom. The two balancing screws are moved towards the top of the wheel in small increments until the wheel is balanced. The wheel may need to be re-balanced after the first time it is dressed, but after that is should be fine until the wheel wears out. The wheel hubs can be used on the next wheel you buy. Balancing Systems are available to fit 1/2", 5/8" and 3/4" grinder arbors. The Oneway Balancing System includes instructions and everything you need to balance two grinding wheels.